Shop GoFit 35 lb. KettleBell (1 ea. )1 ea. Shop GoFit 25 lb. KettleBell (1 ea. )1 ea. Shop GoFit 20 lb. KettleBell (1 ea. )1 ea. Shop GoFit 15 lb. KettleBell (1 ea. )1 ea. Shop GoFit 7 lb. KettleBell (1 ea. )1 ea. 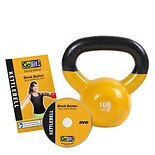 Shop GoFit Kettlebell Butts and Guts DVD (1 ea. )1 ea.